Evidence of Expulsion: Documenting Eviction Rates for Research and Advocacy. The largest metropolitan areas in the United States are in the midst of affordable housing crises. Costs of living are increasing relative to stagnating wages, rent burdens continue to rise for the poorest Americans, and supplies of subsidized and affordable housing are dwindling while more and more renters compete with each other to call them home. As a result, increasing numbers of renters nationally are at risk of receiving an eviction notice. Despite once being labeled the “hidden housing problem” by Matthew Desmond’s landmark research and a growing national media focus have brought increasing policy attention to the nationwide eviction crisis. Most recently, San Francisco and New York City enacted laws providing low-income renters a right to legal counsel in eviction proceedings, and Los Angeles and Philadelphia look to follow in their footsteps. As policymakers increasingly look to eviction prevention as a means of ameliorating the housing crises gripping American cities, existing research unfortunately reveals as many questions as it provides answers. 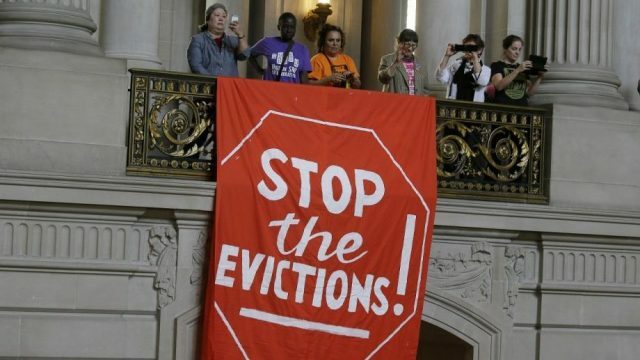 This research project examines two types of evictions: court-processed evictions and evictions filed through the Ellis Act, which is a California law providing owners of rental property a pathway to exit the rental market and evict existing tenants without cause. For court-based evictions, we use a dataset of eviction case filing addresses compiled by American Information Research Services, Inc. (AIRS) in five Southern California counties between 2005 to 2015 to analyze the spatial patterns of eviction cases. For Ellis Act evictions, Professor Lens and Professor Monkkonen rely on data from the Los Angeles Housing and Community Investment Department (HCID), which has generously supplied addresses for every application for a no-cause eviction from 2000 to 2017. Professor Lens and Professor Monkkonen then append data on neighborhood housing and demographic characteristics from the U.S. Census’s American Community Survey and data on residential construction permits from the LA County Assessor’s Office to assess the relationship between new construction on eviction rates (in LA County only), addressing policy debates over new construction’s role in eviction and displacement. Preliminary analysis points to links between concentrated disadvantage, gentrification, and eviction rates. Through these analyses, Professor Gromis, Professor Lens, Professor Nelson, and UCLA doctoral student Yiwen Kuai develop a model that describes the determinants of eviction rates in neighborhoods, cities, and counties in Southern California that can be used to comparatively evaluate eviction’s spatial dynamics.